Since 1924 we have offered skills and experiences that create life-long connections with nature. Summer programs begin 1st week in July and run for 7 weeks into Aug. School year programs run weekends, school vacations, and holidays. April Vacation Camp runs the last two weeks of the month and is filled with themed days related to the wonders of emerging life. Blazing trails, building fires, looking for emerging amphibians, building shelters, making mud art…the week is filled with adventure, exploration, and fun! Spring Break program is designed for 1st through 12th graders. What comes after winter but before summer? MUD SEASON! To celebrate all things sticky and sloppy, we’ll turn our attention to the wonderful world of mud. We'll search for animal tracks on the banks of the beaver pond and see which animals use mud to build their homes. Then we'll build our own nests, dens, and dams. We'll get creative with different styles of earth art, from sculptures to mud paintings. There will also be plenty of games, exploration, and muddy science experiments. Be sure to bring your mud boots! April showers bring….salamanders! These quiet, but amazing creatures are on the move this spring, and we will be too as we explore Waubanong’s ponds and forests for signs of our amphibian friends. We’ll migrate, burrow, swim, dance, and crawl our way through the day with salamander fun and games. Learn how you can help salamanders and frogs safely reach their ponds this spring. Come explorer with us on an off-trail adventure! Follow your senses to the hidden corners of Camp, where we'll find animals emerging from winter slumber and plants sending their first shoots up from the ground. We'll learn how to find our way through the woods using a map and compass or just our own mental memory map as our guide! We'll also learn some helpful plants and go on the ultimate scavenger hunt to cap off the week of exciting exploration. Sliding scale $300+* per week. *Tuition is based on a self-determined sliding scale. If you believe that children belong outside, and that the tools of imagination are what build a happy childhood, then welcome to our wooded world. Spontaneous play, exploration, cooperative problem solving, and moments of wonder are what we witness each day in our all-outdoor year-round nature immersion programs for our youngest participants. Nature is the teacher. We are mentors and facilitators, helping young children connect with their bodies, the elements of nature and each other within a safe explorative space in the outdoors. We help young children connect with nature and each other, while exploring a safe space in the outdoors. Each day at Sunshine Camp kids discover the wonders in the woods around our camp, sing songs, and share stories. They use natural materials, such as clay, rock-paint, bark, and leaves to create works of woodland art. Our forest playground includes trails to explore, forts to build and play inside and puddles in which to stomp and splash. Sunshine Camp runs Monday – Friday, from 9:00am to 4:00pm. Please bring water, snacks, and a bag lunch each day. Early drop at 8:30am and late pick up at 4:30pm available for a fee please inquire. Woodland Camp is our foundational primer for camping, safety and discovery. Are you ready for an epic adventure? Built your own fire? Made a home to keep you dry? Or ever carved wood? We’ll cook on fires, harvest wild edibles, make rope, tie knots and learn many other essential skills. We’ll also play our favorite outdoor games for a healthy dose of unmatched fun. Day campers are welcome to stay for our Thursday night closing campfire, which runs until 8:45pm. Campers are assigned to a cabin in order to become acquainted with “camp life”, and feel just as connected to camp as our overnight campers. Day campers should plan to bring a bathing suit and towel each day. They also should bring one blanket and pillow to use on their bunk during rest hour. Our Woodland Camp runs Monday – Friday, from 9:00am to 4:00pm. Please bring water, snacks, and a bag lunch each day. Sliding scale $350+* per week including Thursday overnight. Forager Camp is all about honing wilderness skills. We’ll cook on fires, harvest wild edibles, make rope, tie knots, navigate in the wilderness, and learn many other essential skills. We’ll also play our favorite outdoor games for a healthy dose of unmatched fun. Foragers are encouraged to stay for our Thursday night closing campfire at 8:45pm and wilderness campout. Foragers will have time during the week to build their shelter for the campout Thursday night. Campers should plan to bring a bathing suit and towel each day. If staying overnight on Thursday campers will have a bunk set up in a regular cabin group so that the transition is seamless for them that night. Foragers Camp runs Monday – Friday, from 9:00am to 4:00pm. Please bring water, snacks, and a bag lunch each day. Please email us with any questions about this program info@campwaubanong.com. Ready to sleep under the stars? Sliding scale $475+* per week. Join us for a week of thriving and surviving at Forest Camp. Become the eyes and ears of the forest as you learn confidence through the skills of the scout. Discover how to blend into the landscape through the arts of camouflage, navigation without compass or map, and stealthy movement. Together with your fellow adventurers you will build fire from friction, make and use natural tools, identify and harvest edible plants, cook over open fires, sleep in a rain-proof shelter you build yourself, and more! In addition, Forest Campers will potentially swim, play capture the flag, pick wild raspberries & blackberries, play music, tend the camp garden, build wilderness shelters, or tend to camp homestead animals during free time. Forest camp inspires youths natural discovery, cooperation, responsibility, and independence. Campers spend their week sleeping in our Adirondack shelters and/or the forest surrounding our main campus with up to eight other campers. Our girls and boys sleeping shelters are located on opposite ends of camp. The week for traditional overnight campers begins with drop-off at 4:00PM on Sunday, and lasts through pick-up at 4:30PM on the following Friday. Sliding scale $525+* per week. Wilderness Leadership campers experience immersive nature-based skills training, inspiring challenges, and outrageously fun activities under the guidance of seasoned wilderness instructors. Leadership Overnight Camp offers three 2 week long sessions for boys and girls 13-15 who are looking to develop leadership skills. This program challenges teens to step out of their comfort zone, meet new people, and discover their own ability to lead and inspire themselves and others. Leadership Camp is designed to build confidence, friendships and outdoor skills - and offer some of the most positive formative experiences in a young person's life. Campers in the Leadership Program learn communication skills, conflict mediation, and help plan and facilitate group activities. Although the emphasis of this program is on leadership skill development, Leadership campers get plenty of time to relax, play games, and splash in the pool! Overnight Camps are a perfect opportunity for youth to safely put their skills to the test. What your kids learn with us are truly helpful life skills that will travel with them far beyond the camp experience. Wilderness campers venture off campus to join our lead staff members on paddling, swimming, or hiking adventure each week. Our girls and boys sleeping shelters are located on opposite ends of camp. Our traditional Adirondack shelters can be used during the week for sleeping or Leadership Campers can build shelters as well if they choose. The week for Leadership Overnight Camp begins with drop-off at 4:00PM on Sunday, and lasts through the following week pick-up at 4:30PM on Friday. Sliding scale $200+* per week. LIT's live in cabins the first week and can choose to stay in backcountry shelters they personally build the second week. LIT's must attend camp for a minimum of two consecutive weeks. The first week is spent facilitating with Woodland Day Camp and the second week is spent in the backcountry with the Forest Overnight Camp. LIT's participate in the pre-day game plan with staff which allows teens to begin developing an awareness for both curriculum design as well as the need for improvisation, making last minute changes due to things like weather or new opportunities. LIT's participate in all aspects of camp life with their cabins (activities, meals, overnight). With the support of Instructors, LIT's will play dual roles; both as participants, practicing skills with the group, and as assistants, being called upon to lead activities. This position is highly recommended for anyone interested in becoming an Instructor in the future. LIT spots are open to anyone, although preference is given to former campers in filled weeks. The week for LIT's begins with drop-off at 4:00PM on Sunday, and lasts through pick-up the second week at 4:30PM on Friday. Please email applications if possible – if sent to our postal box will take longer to process and respond. Come experience summer camp as a family! This weekend is open to campers who spent time at Camp Waubanong during the summer to share camp with their families as well as to anyone who wants to just see what camp's all about. We will spend the weekend connecting with nature, slowing down our pace, and learning wilderness living skills together. Enjoy exhilarating games and new challenges together with family and new friends. Families will sleep together in Adirondack shelters, tents, or debris huts made by the family. contact us: info (at) campwaubanong.org for pricing and further info. 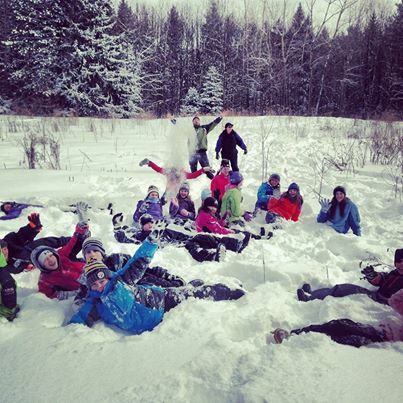 Bring one or more buddies to Camp Waubanong for their first time and you will each receive $30 off your tuition. For the second and subsequent siblings in a family per week. If you register and pay your deposit at least 5 months in advance of your program. Sign up for 7 sessions of camp and get a $150 discount.